The new monetary bazooka (one commenter on Twitter feed likened the change in policy to Kuroda's tossing aside his cash bazooka in favor of a B-52 bomber) blew the yen-dollar exchange rate right past the 110 range which political noisemakers were last week declaring a line in the sand, at least until after the April 2015 Unified Local Elections. My hometown paper, the Tokyo Shimbun, reacted, from a look at its headline, in an entirely predictable, populist way to the news. Strange, no celebration for the increased chance the BOJ will reach it goal of 2% inflation in a reasonable span of time. Or for the increased profits Japan's large multinationals will get to book again this year due to the certain decline in the value of the yen vis-a-vis other currencies. 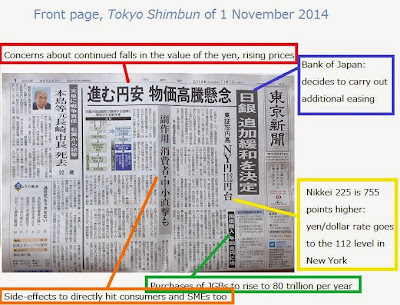 "We the Abe Administration and compliant governors of the Bank of Japan will goose your equities prices and turbocharge your profits. You corporates will dramatically raise salaries and hiring of your permanent employees, and not just double bonuses, creating a positive inflation expectations loop from which all of society can benefit...oh and no wanking around with further increased hiring of temporary workers to replace permanent workers! We're watching you." In the last year's hiring and this year's spring Labor Offensive (shunto) the executive suites of Japan's corporates utterly failed to return the favor Abe and Company had done for them. So having been burned once by the executives, why is the Abe Administration willing to double its bets on the capacity of the executives of the multinationals to pitch in, behaving in a patriotic, sharing way? Perhaps it is because Abe Shinzo believes that to do so is in the marrows of the executives, their very DNA itself. From ancient times unto the present, this country called "Nippon" has been a place where one rises early in the morning and cultivates one's fields and rice paddies, sweat streaming. When the Autumn comes, together, with the Imperial Family at the center, we pray at the Festival of the Five Grains. This is the "Mizuho no Kuni." It is based upon self-reliance and self-help. If by some ill-chance a person should fall ill, all of the inhabitants of the village would help [the ill person]. This from ancient times unto the present has been the social welfare system of "Nippon." It is bound up in the DNA of the Japanese people. I believe there is a capitalism of a Mizuho no Kuni that is appropriate for a Mizuho no Kuni. However, while having an emphasis on an economy where there is free competition, it is not the capitalism that takes, as its motive force, greed, the type that has emerged out of Wall Street to take the world by storm. Emphasizing ethics and rules (dogi) and with a sense of what real wealth (makoto no yutakasa) is -- a form of market-based ideology in the Mizuho no Kuni that is appropriate for the Mizuho no Kuni. The Abe family has its roots in Nagato City, from long ago the township of Yuya. 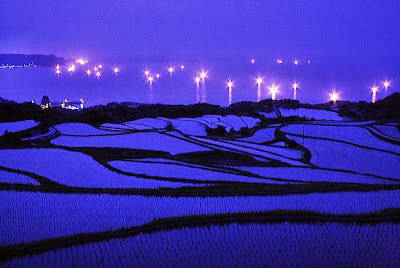 There are terraced rice paddies there. They face the Sea of Japan and when they are filled with water, in each one there is a reflection of the Moon, the reflections of the lights of the distant fishing boats. It is so beautiful as to take one’s breath away. The labour productivity of terraced rice paddies is low. From the point of view of economic rationality they are nonsense, perhaps. But precisely because there are these terraced rice paddies, this is my ancestral home. Furthermore, because we have these rural vistas, is this not why a graceful and lovely Nippon exists? Amid a market-based ideology, tradition, culture and regional difference can still be emphasized. I want to go forward thinking about the means to an economy appropriate to a Mizuho no Kuni. But wait, wait, the historians are crying, this is the romanticized, a-historic vision of the moral village, the pure agrarian life the young officers and fanatics of the pre-war era pledged to defend --- and in the 1920s and 1930s those guys would ASSASSINATE the capitalists! As for pushing today's capitalists to get with the program on behalf of their fellow Japanese and not just themselves, can one think of anything more convincing than a reminder from Abe of a glorious and clearly more beautiful past? One that says in the very simple and vivid terms, "Be Generous"? 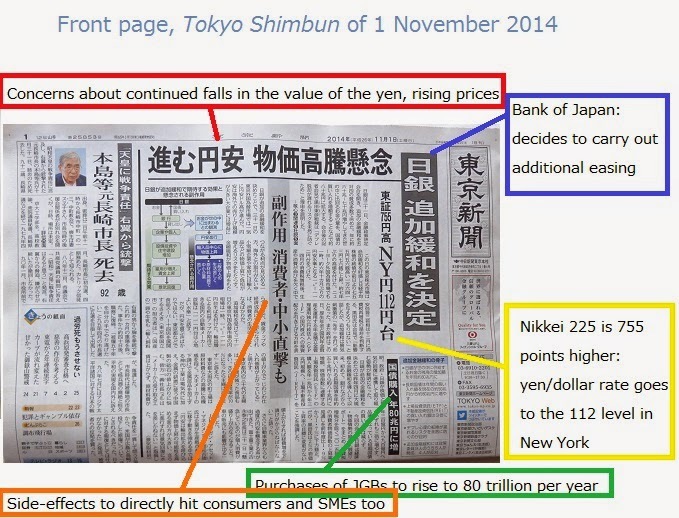 Are you not worried that the BOJ will lose control of the currency and it will plummet? I am. I mean, say what you want about the tenets of Mizuho no Kuni, dude, at least it's an ethos. The Nikkei 225 (日経平均株価) is not the same index as the Tokyo Stock Price Index (東証株価指数), or TOPIX. The former by definition only includes 225 major stocks and is weighted by their share prices. The latter includes 1,669 stocks (a broader sample of the market) and is weighted by the free float principle. I was straining my eyes to read the small print of the Tokyo Shimbun, but I think that they might have actually been referring to the TOPIX (東証) in the article, not the Nikkei 225. The Tokyo Shimbun's front page does use the compound 東証。However, only one stock index rose 755 points on Friday and that was the 日経平均株価　(Nikkei 225)。So 東証 is a contraction of 東京証券取引所 (the Tokyo Stock Exchange) and not the first two characters of the Japanese name of the TOPIX （東証株価指数).